Of course I don't have an objective viewpoint here, but I think the suggested deleted lines don't contribute anything to the understanding of the OP. Every original intent of the post can be compacted as shown in my suggested edit; it is acceptable for a non-mathematician to have unconventional or personal interpretation in here. So why is this edit bad? Here's a list of reasons why I found your edit undesirable. Changing the title from a statement to a question is a matter of taste. I don't like edits based on taste because they don't make the post easier to read or to find. Now, I am confident with the mathematical definitions and all the formalism, and (more or less) I know all the main theorems. which is worse than just editing based on taste: it removes some information about the question authors background. 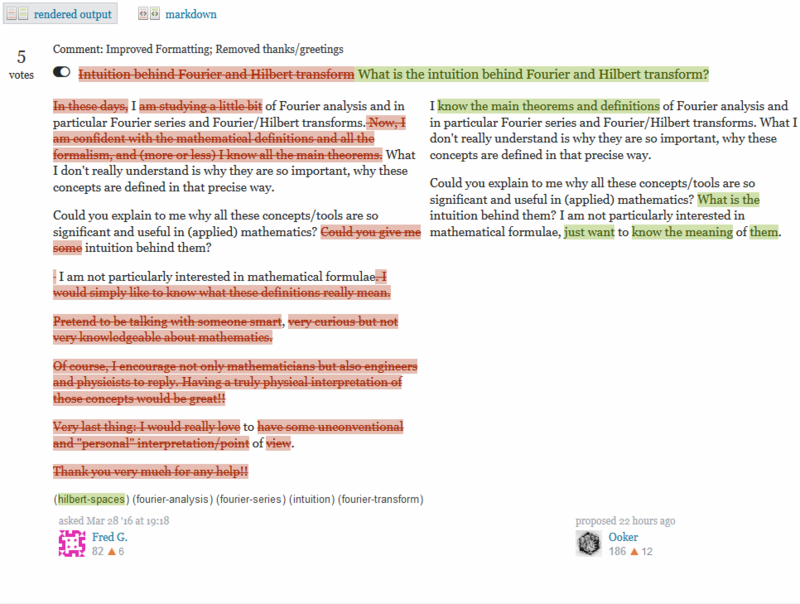 Note the use of the adjective "mathematical" before "definitions" and the word "formalism" and the phrase "more or less". These all indicate to me that the author isn't greatly familiar with proof based mathematics. Pretend to be talking with someone smart, very curious but not very knowledgeable about mathematics. Having a truly physical interpretation of those concepts would be great!! I would really love to have some unconventional and "personal" interpretation/point of view. which is the main reason I felt your edit went against the authors intent. Lastly, you added the hilbert-spaces tag because...why?